‘Chase Away Childhood Cancer’ Specialty License Plate Launches in Time for Childhood Cancer Awareness Month | Neuroblastoma Research and Fundraising: Chase After a Cure! SUMMERVILLE, S.C. – Beginning today, there’s a new way for South Carolina residents to show their support for childhood cancer research efforts. A pediatric cancer specialty license plate is now available from the S.C. Department of Motor Vehicles. Proceeds from the purchase of the plates will benefit Summerville-based Chase After a Cure, which has raised more than half a million dollars for pediatric cancer research at the Medical University of South Carolina Children’s Hospital. 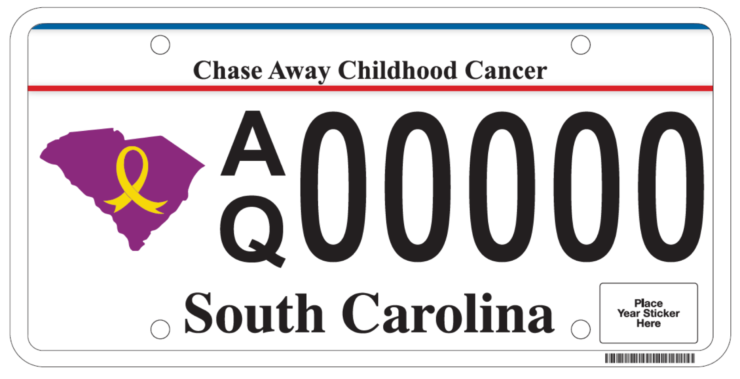 The “Chase Away Childhood Cancer” plate is available for motor vehicles. 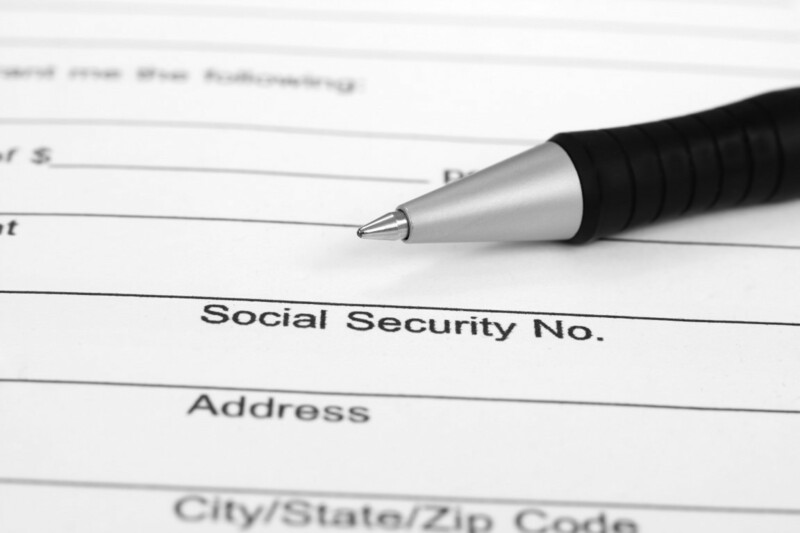 The cost is $50 every two years in addition to the regular motor vehicle registration fee. Order plates online at scdmvonline.com, by mail or at the local DMV office. The release of the license plate at the beginning of September coincides with Childhood Cancer Awareness Month, a nationwide effort to bring attention to the critical need for more pediatric cancer research funding. 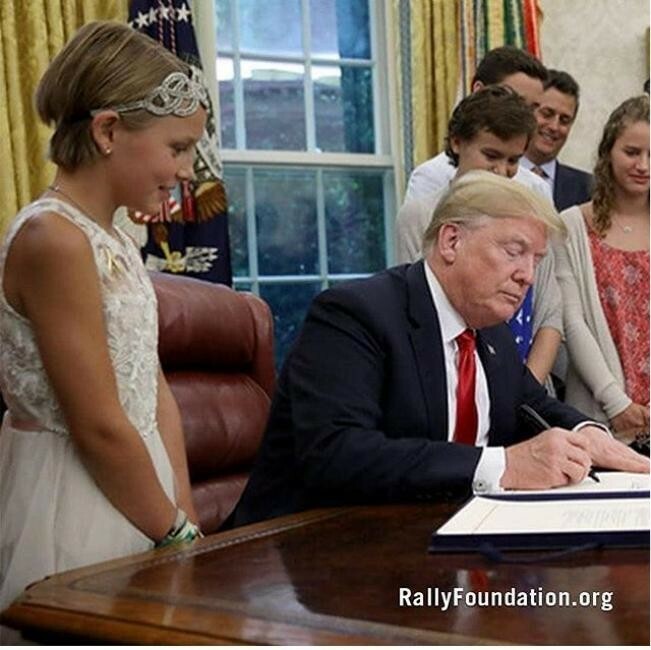 In the United States, 15,780 children under the age of 21 are diagnosed with cancer every year; about one quarter of them will not survive the disease. The push for a state license plate started with Summerville area mother, Julie Reynolds. She approached Chase After a Cure with the idea, hoping to honor her 17-year-old daughter Rachel, who died in 2014 from a rare form of cancer. Chase After a Cure was quick to lend its support. 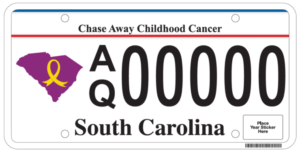 The “Chase Away Childhood Cancer” plate was approved by the S.C. Legislature in 2017. Childhood cancer advocates around the country are working to get a childhood cancer license plate in all 50 states. 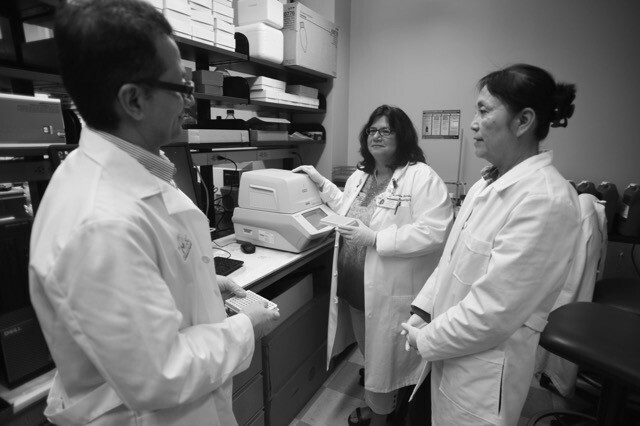 Chase After a Cure funds innovative research and promising clinical trials that have the potential to immediately impact the lives of pediatric cancer patients. Cancer is the No. 1 cause of death by disease among children. In fact, the incidence of childhood cancer has been rising about 0.6 percent each year since the mid-1970s, resulting in an overall increase of 24 percent over the last 40 years. Despite the growing number of children diagnosed with a form of pediatric cancer only three drugs have been approved by the Food and Drug Administration. Chase After a Cure was started in 2009 by Summerville, S.C., resident Whitney Ringler and her family after her son, Chase, was given a 30 percent chance of survival after being diagnosed with Stage 4 neuroblastoma. Chase survived this aggressive form of cancer. Chase After a Cure is dedicated to funding research and raising awareness for alternative and more effective treatments for children with cancer with a specific focus on hard-to-treat cancers such as neuroblastoma. For more information, visit www.chaseafteracure.com.